Dancer-choreographer Cynthia Oliver’s new work, “Virago-Man Dem,” searches for an expansive view of black masculinity. Oliver, a dance professor at the University of Illinois, premiered the work at the Brooklyn Academy of Music in late October. 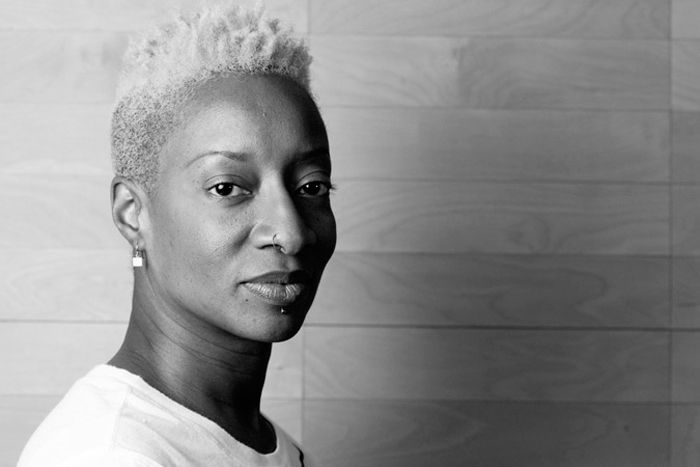 CHAMPAIGN, Ill. — Dancer-choreographer Cynthia Oliver has devoted her career to portraying women’s worlds, but her latest work takes a radically different turn, looking for a more expansive view of the concept of black masculinity. “Virago-Man Dem” considers male behaviors within Caribbean and African-American cultures, and how black men find themselves restricted by societal codes and taboos. 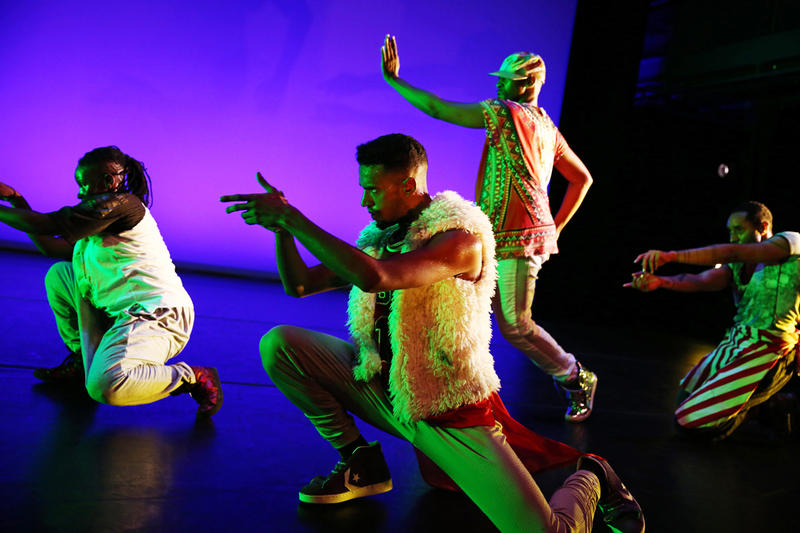 “It was born out of a desire to offer to the world another view of black masculinity that is more nuanced and flexible and stylish and funny and tender and rich than those we are persistently burdened with in the contemporary American landscape,” Oliver, a University of Illinois dance professor, wrote in the program notes for the work. 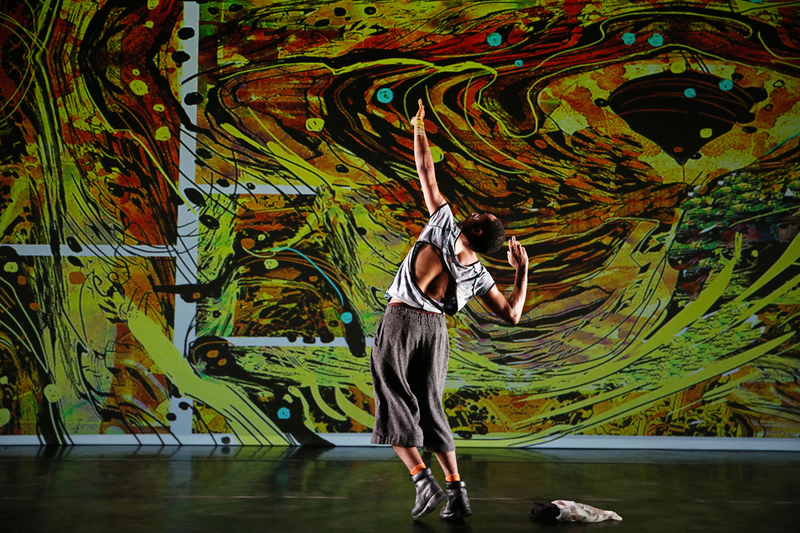 The dance-theater piece premiered at the Brooklyn Academy of Music’s Next Wave Festival in late October, followed by performances at the Dance Center of Columbia College Chicago in early November. “Virago-Man Dem” depicts the fluidity of notions of masculinity, both through the movement of the dancers and in its title. “Virago” is a term used to describe a woman who transgresses or demonstrates what is seen as masculine behavior. “Man-dem” is a Caribbean phrase indicating plurality, used instead of “men,” and is also a greeting to a group of friends. The dancers are Niall Noel Jones and Duane Cyrus, both graduates of the U. of I. dance department’s Master of Fine Arts program; Jonathan Gonzalez; and Ni'Ja Whitson, a gender-nonconforming house dancer who joined the cast in May. The addition of Whitson “lent a level of complexity” and “really pushes that level of comfort, or discomfort” to the question of whether masculinity must be tied to biology, Oliver said. The visual images in “Virago-Man Dem” were created by the graphic art team Black Kirby: John Jennings, a professor of media and cultural studies at the University of California, Riverside; and Stacey Robinson, a University of Illinois graphic design professor. 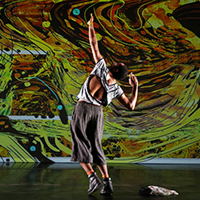 The backdrop against which the dancers move is a series of images by Black Kirby, an artistic team that created the visuals for the production. Black Kirby consists of John Jennings, a graphic artist and professor at the University of California, Riverside who previously taught at the U. of I., and Stacey Robinson, a U. of I. professor of graphic design. “We started talking about images of black men in various media. I wanted there to be a series of images that are historical, contemporary and futuristic, that both indict the viewer and offer hope for what is possible,” Oliver said. Her other partners on the project are projection and animation designer John Boesche, a U. of I. theatre professor who teaches media design; composer Jason Finkelman, Oliver’s longtime collaborator and husband, and the artistic administrator of the U. of I.’s Center for World Music; costume designer Susan Becker, a U. of I. art and design lecturer; and lighting designer Amanda Ringger. Oliver’s previous work has been in creating performances influenced by dance, feminism and black popular culture. While her work has dealt with the stories of women, "of course you are taking note of what is happening with the other gender,” Oliver said. Having a son also spurred her interest in changing directions with her work. 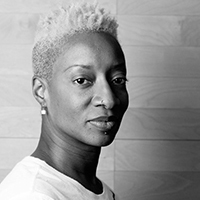 Cynthia Oliver’s work has looked at the expressive performances of black women. “Virago-Man Dem” is a departure from telling the stories of women, motivated in part by watching her son find his place in the world. The Caribbean is one such place. While the culture is often seen as homophobic, “it also has a wildly flexible set of practices for men in terms of style. There’s a way in which men can express themselves that is quite different,” said Oliver, who grew up in St. Croix, U.S. Virgin Islands. As she created a production about the behavioral expectations of men, Oliver showed the work to groups of men and listened to their feedback. One of those audiences was a group of inmates at the Danville Correctional Center in Danville, Illinois. Oliver taught a class there through the U. of I.’s Education Justice Project, and as part of the class, she showed a video of the production and talked with the men about it. “Virago-Man Dem” will be performed in Washington, D.C., and Philadelphia in January. Editor’s note: To reach Cynthia Oliver, email coliver@illinois.edu.